Soldiers had foot lookers and beds in barracks, but sailors had to make do with a sea-bag and a hammock. 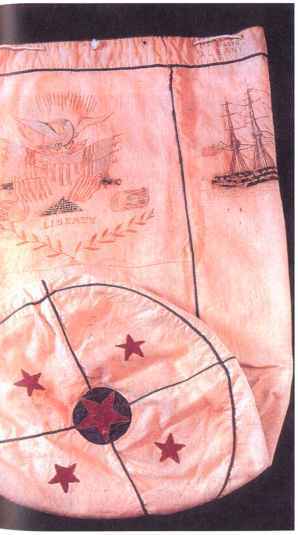 Inevitably, sailors had long spells of idleness aboard and a traditional past-time was embroidering their property with a mixture of simple decorations and patriotic emblems. 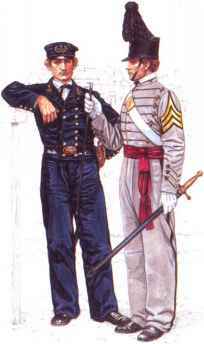 The Union sailor was issued with adequate supplies of well-made personal equipment, unlike his opponent in the South, who had to make do with whatever he could get his hands on. 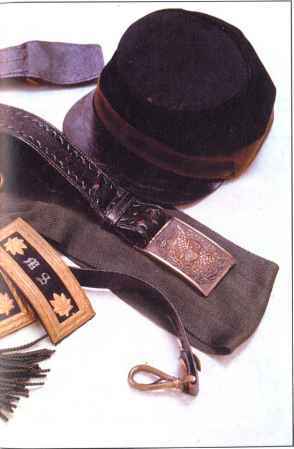 The items shown here are all made of good quality leather and are in virtually the same condition as the day they were issued to their first owner 140 years ago. 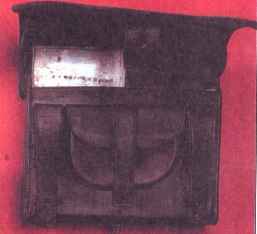 3 Cartridge holder for rifle ammunition. The petty officers were the men who really made the ship function properly. They were the boatswain's mates who passed and carried out the orders that ensured that the captain's instructions were obeyed. They were the gunner's mates who managed each cannon. They were the carpenter's mates and sailmaker's mates, and supervised the ship's stewards and cooks. Each petty officer gave a vital task the personal oversight required to get the job done and to keep the ship in perfect running order. The petty officer seen here wears much the same type of uniform as the common seamen. In this case he is wearing blue woolen "bell-bottom" trousers, which had legs that increased in width toward the lower end, thus making them easier to roll up, although white duck trousers were usually worn in high temperatures. His white shirt bears his badge of rank on the sleeve, an embroidered foul anchor and also has dark blue cuffs with white piping. Round his neck he wears a traditional sailor's collar, also with three narrow white stripes. 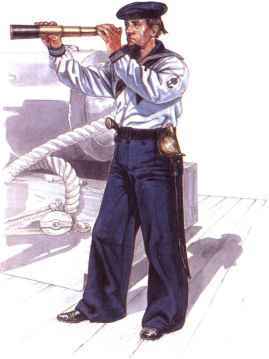 This boatswain carries a pipe or whistle on a lanyard, and is armed with a cutlass and a revolver.